The Power Plant was built in the early 1920's by the Security Benefit Association for its complex of buildings -- hospital, orphanage, two homes for the elderly, apartments for staff and the plant operations shop. It used three coal burning boilers, two of which were installed in 1921. It also housed the laundry and the pumps which brought the water supply from the Kansas (or Kaw) river. 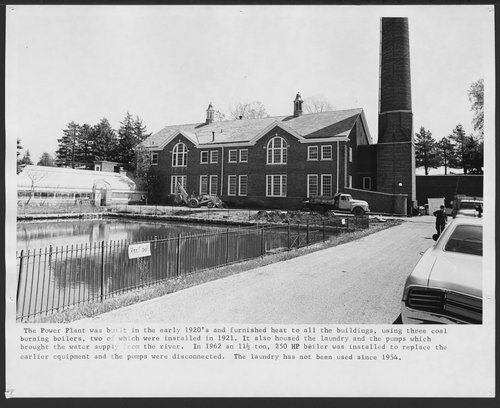 When the Menninger Foundation purchased the complex, an 11 1/2 ton, 250 HP boiler was installed to replace the early equipment and the pumps were disconnected in 1962. The laundry has not been used since 1954.